Bees are very interesting social insects. Like most - OK some of us - they are highly disciplined and stick to a rigorous routine. When handled properly by a trained beekeeper, their products – honey, propolis and wax - can provide healthy products and a valuable source of income. 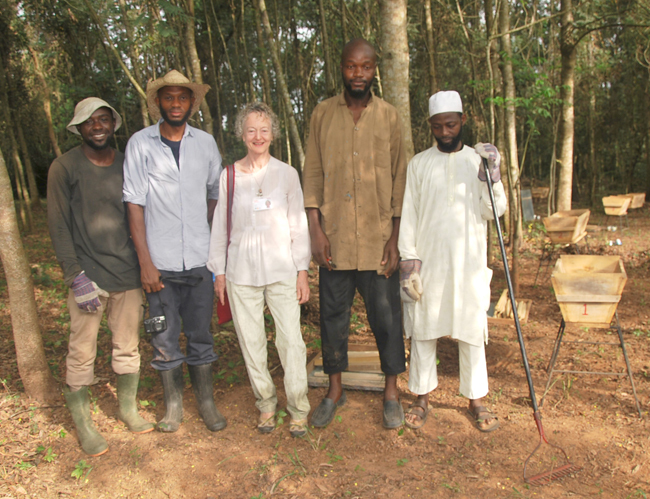 Beekeeping is not new to IITA Ibadan - there are reports of abandoned hives in and around the campus – but this project is the first joint venture between IITA and a local company, Earthly Produce Limited (EPL). The idea for the project was inspired by IITA International School’s December 2010 production, Fern Gully, a play based on the theme of biodiversity. The objective is to demonstrate the vital role forests play in providing sustainable natural resources which can generate earnings with very little investment or effort, especially for rural communities. An area approximately 2,500 sq. m. in size, located in the IITA forest has been selected as the site of the apiary. It has a wide variety of trees and will provide shade and excellent sources of nectar and pollen for the bees. Ten Kenyan Top Bar hives, each with 20 top bars were installed on 20 February 2012. The choice of hive was based on the cost and ease of construction and also the low level of management required compared to other types of hives. The wood used to construct the hives is from locally grown Gmelina arborea trees, chosen for its strength and durability. Installing the hives at this time of the year is ideal as it falls within the honey flow season and there is also a high possibility of catching bee swarms. Idris Olaniyan, Femi Kesington, Deni Bown (IITA), Jubril Abanikanda and Abdul Wahid Ibrahim at installation of EPL beehives in IITA forest. In addition to developing the apiary, EPL will organise training seminars on beekeeping which will include both theoretical and practical sessions. The seminars will cover the basics of beekeeping such as hive construction, managing hives, beekeeping equipment and other topics necessary for the beginner. They will also highlight the importance of beekeeping to farmers and the vital role that bees plays in pollinating crops. So when next you see a bee foraging on a flower take a closer look and observe what it is doing. As long as you don’t touch it, the chances of getting stung are quite slim. But BEE careful near a beehive or the nest of a wild colony. Without proper protective clothing and know-how this could BEE quite dangerous!